Where style and practicality are important, Arena’s wood Expressions range is the perfect solution. With colours handpicked to reflect both current trends and classic favourites, Expressions combines the beautiful look of real wood with all the benefits of PVC. Incredibly hardwearing, they’re at home in any room of the house but especially perfect in Kitchens and Bathrooms. – New decorative headrail shape; attractive enough to have with or without the valance. – Exceptional top slat closure achieved with unique light block strip on underside of headrail. – Extra pull on cords will lift the slat to close the gap. – SmartPrivacy™ – available on Metro White & Vellum White 50mm slats. No slat punch holes for operating cords, but instead the patented coding system ensures the cord runs outside the slats, allowing more complete closure. – Coming in January 2018: decorative printed tapes and contrasting tapes as a surcharge option. 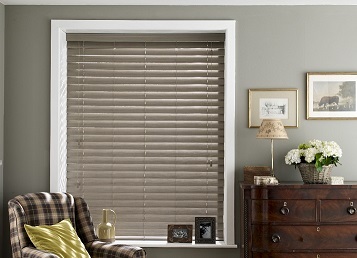 The new extended range of Sunwood “Faux” Wooden Venetian Blinds can now be viewed online. Please CLICK HERE to view the collection. I will update the page with more information shortly! !